Here are some worship resources for a celebration of the Lord’s Supper / Communion / Eucharist. and quench our deepest thirst. into even the darkest corner of our lives. into our heart, and mind and soul. Uncurl your strength and beauty within us. and show it in the things we do and say. Through Jesus our Brother and our Saviour. in holy times of birthing new life amid all the suffering. encouraging us to welcome all in our midst. ~ posted on the Rex A.E. Hunt website. in the power and glory of your kingdom. ~ from the Church in Wales Holy Eucharist 2004. Posted on the USPG: Anglicans in World Mission website. ~ from the Grace website worship archive. On their own, the bread and wine are nothing. the faithful and the fickle. and of a world made whole. the wrong-doer and the wrongly done by. It would not be God’s table without them. ~ Cheryl Lawrie, on the [hold this space] blog. threshed and milled for flour. We are formed from the grain of God’s harvest. Flour is mixed with water to produce basic dough. The water of baptism unites us. Yeast is added to transform the mixture. The vision of God’s realm draws us onwards. Oil softens the dough and makes a new texture. The Holy Spirit anoints us as the body of Christ. A little salt improves the taste. Jesus calls us to be the salt of the earth. The bread is kneaded and shaped, molded and baked. 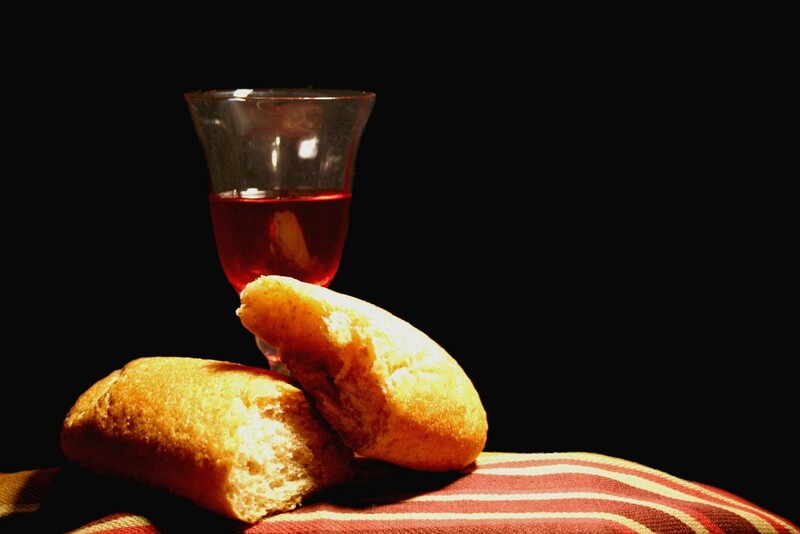 It is God who makes us a holy communion. Grapes are harvested and crushed for juice. You are the vine, we are the branches, O Christ. Juice and skins are mixed with yeast for fermentation. God’s reign is coming. God’s hope is here. There is a time of waiting; then a time of pressing. God’s new life presses forth through the sediment of our lives. And finally, the feast is here! Let us celebrate the feast of our life in God. ~ written by Anita Monro and posted on the MAD-e-Lena blog. ~ Timothy Dudley-Smith. Words copyright © 1984 Hope Publishing Company. If you use this song in worship, be sure to report it on your CCLI license. ~ Chris Tomlin, Daniel Carson, Ed Cash, Jesse Reeves. Copyright © 2008 Vamos Publishing (Admin. by EMI Christian Music Publishing), worshiptogether.com songs (Admin. by EMI Christian Music Publishing), sixsteps Music (Admin. by EMI Christian Music Publishing), Wondrously Made Songs (a div of Wondrous Worship & Llano Music, LLC [Admin. by Music Services, Inc.]). CCLI Song # 5183443. If you use this song in worship, be sure to report it on your CCLI license. ~ Matt Maher, Matt Redman. Copyright © 2009 Thankyou Music (Admin. by EMI Christian Music Publishing), spiritandsong.com (Admin. by EMI Christian Music Publishing), sixsteps music (Admin. by EMI Christian Music Publishing), Said And Done Music (Admin. by EMI Christian Music Publishing), Icel (Admin. by EMI Christian Music Publishing). CCLI Song # 5484616. If you use this song in worship, be sure to report it on your CCLI license.